Wi-Fi can be fickle. The RF signals and wireless devices don’t always do what’s expected – it’s as if they have their own minds at times. A Wi-Fi network that’s been quickly or inadequately designed can be even worse, spawning endless complaints from Wi-Fi users. But with proper planning and surveying, you can better design a wireless network, making you and your Wi-Fi users much happier. Here are some tips for getting started with a well-planned Wi-Fi site survey. If you’re only trying to cover a small building or area that requires a few wireless access points (AP), you may be able to get away with doing a Wi-Fi survey using a simple Wi-Fi stumbler or analyzer on your laptop or mobile device. You’ll even find some free apps out there. Commercial options range from a few dollars to thousands of dollars for the popular enterprise vendors. Using a simple Wi-Fi stumbler or analyzer, you can walk around while looking at the signal level of the APs you’re surveying to get an idea of the signal propagation, coverage boundaries, and possibly the data rates. This is an on-the-spot approach; you would visualize in your head where the coverage boundaries are, or sketch them on a floor plan or map of the area. For networks that will require more than a handful of APs, a map-based survey tool is recommended. There are some free or low-cost options, but the popular enterprise-level solutions go into the thousands. Using a map-based survey tool (pictured) allows you to load a floor plan or map of the area into the software and then walk around while marking your location. In the end, you have a heatmap of the signal, noise, signal-to-noise ratio, data rates, and other results. This allows you to better visualize the coverage and performance of the APs and any neighboring networks. It also provides a better way to save and view the data after the fact than what you’d get using a Wi-Fi stumbler or analyzer. Some map-based tools also allow you to do full predictive/simulation surveys without being on site, which can be cost-effective if done correctly and allows you to survey future builds. When surveying, use the same AP and antennas that will be installed. However, try to use any autonomous model or mode so you don’t have to wrangle with a wireless controller. Configure the AP as closely as you can to the settings that will be deployed, especially the frequency bands, channels, transmit power, 802.11 mode, and security. 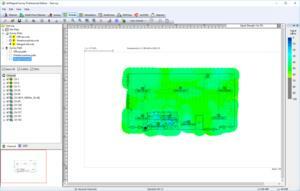 Use realistic transmit power levels for the survey AP. Typically you want the total effective isotropic radiated power (EIRP) of the AP and Wi-Fi clients to be similar, which usually means using a much lower level on the AP compared to its maximum. If adding or modifying an existing network, perhaps look at the average power levels of the existing APs. During surveying, use the same AP antennas that will be installed as well. If you’re using an AP with detachable antennas and are going to use additional antenna cable, consider that when selecting the transmit power levels so you have the EIRP that you desire. Also consider the Wi-Fi clients you use for the surveying. Due to the limited number of clients supported by surveying software, you may not be able to choose a very good representative client depending on the various clients that will be used on the network. However, some map-based survey tools allow you to simulate other client types and show simulated heatmaps based upon the survey data collected. Even if the tool doesn’t allow this, you can do a rough simulation by adjusting the minimum signal levels when designing the network. Before surveying, you should define the minimum levels of the network specs, so you have something to base your decisions on. At least define the minimum signal, signal-to-noise ratio, overlap percentage, throughput, and client-per-AP levels. When viewing the data, you can then adjust the thresholds of the survey data or heatmaps based on these minimum levels, which will quickly show any lacking areas. Before starting your surveying, do a full site walk with the floor plan to double check the accuracy of the floor plan. Also look for landmarks or other markers to help you quickly understand your location. For instance, in a warehouse with rack aisles, ensure the aisle numbers are marked on the floor plan loaded into the survey software. Ensure all doors you need to get through are unlocked ahead of time. During the survey, it’s best to close doors behind you if they’ll typically be closed, in order to get more realistic survey results. Choose to perform the Wi-Fi surveying at a time when the environment is at its usual state in terms of RF propagation. Also, consider surveying when it’s at its peak if you want to get an idea of the worse-case scenario. When choosing a time, consider the amount of people and equipment in the area and the amount of movement they make. Generally, the more people, equipment, and movement you have, the less range or stability you’ll see with Wi-Fi signals. Pay attention to the amount and location of Wi-Fi clients in each area as well, along with any movements they may make during usage. In non-typical usage cases, such as Wi-Fi antennas on vehicles, you may have to get crafty in your survey setup. When surveying, keep in mind any planned construction or physical changes to the building or environment. Perhaps incorporate the plans into your design or make a note to re-survey after the changes. For AP-on-a-stick surveys, where you put up a temporary AP and walk around to survey, you may want to invest in a good survey tripod or cart. I’ve seen some surveyors temporally mount the AP using zip ties or the typical ceiling title mount, but a tripod or cart specifically designed for surveying is usually much better if surveying large buildings or areas. A tripod or cart allows you to quickly extend the AP or antenna(s) up to the desired spot without a ladder, and some come with a power supply or at least allow you to easily carry one so you don’t have to worry about finding an electrical outlet at each desired AP location. There are a few commercial solutions, from vendors such as HiveRadar and CasterTray, but you can also look into a DIY setup. I have made custom survey carts (pictured) using a collapsible cart, multi-purpose telescopic poles, and zip ties. For indoor ceiling mount APs, I use an angle adapter on the pole, hang a small piece of plywood from that adapter, and then attach the typical AP mount to the plywood. For heavy APs (like outdoor models) with detachable antennas, I only put the antennas up in the air. For directional antennas, I use a standard pole mount on the telescopic pole. For detachable omni antennas, I craft a makeshift mount with plywood and straps to space out the antennas correctly. After you’ve installed a Wi-Fi network, you should do a post-install survey to ensure all is working as planned. The actual install may have deviations from your original design, which could be intentional changes from issues that arose or mistakes that occurred during the physical install or configuration of the wireless controller. For this reason, I recommend starting with a review of the wireless controller configuration and then doing a site walk to physically check all the APs and the orientation of any external antennas. The complexity of post-install survey varies based on the size of the network. For smaller networks, you may be able to use a Wi-Fi stumbler or analyzer as you may have done for the pre-install survey. For larger networks, it's worth doing a full map-based survey before turning it over for production use. It’s also a good idea to occasionally re-survey the site, perhaps annually. Re-surveys also should be done if there are big physical changes to the building construction, layout, or environment.